Less than 10 days left to propose a session for the American Association for State and Local History Conference to be held in St. Paul, September 17-20, 2014. Don't miss out on the biggest history meeting in Minnesota history. Who says the Vikings only play in Minneapolis? Big Ole from Alexandria is having fun in iconic Rice Park amid the many historic landmarks, steadily gazing at the beautiful St. Paul Public Library and James J. Hill Reference Library buildings, listed in the National Register of Historic Places. To the left of Ole is the 1902 Old Federal Courthouse - the very first building in Minnesota to be listed in the National Register of Historic Places - and the site of many events related to St. Paul's notorious gangster history. To the right of Ole and peeking over the trees is the 1910 St. Paul Hotel, which was the US News Travel's 2011 "Best Hotel in Minneapolis." Yes, that honor is still hilarious to St. Paulites and a taste of what is meant by AASLH's 2014 theme: Greater Than the Sum of Our Parts. And best of all, these parts (Rice Park) are just two blocks from the conference hotel. Completion of the research stage for the first film to highlight Robert Bly's fifty-year engagement and contribution to American culture, especially in the realm of poetry, publishing and translation. In 2008, Robert Bly became Minnesota's first Poet Laureate and in 2000, recipient of the McKnight Foundation's award for Distinguished Artists. The source materials of the film will be donated to the Robert Bly Archives at the University of Minnesota, a contribution of tremendous value to current and future scholars and students. Minnesota Local History fans, what have the 1268 of you been up to? Post on our Facebook page to share news with your colleagues! Chippewa County Historical Society, Montevideo MN, has new aerial photos of their site. Are you ready to join the History Relevance Campaign? Check out this hefty bibliography of public history resources. So you want to be a museum consultant? Iowa Architectural Foundation (IAF), Des Moines IA, seeks Director. Deadline: November 15, 2013. Minnesota State Arts Board, St. Paul MN, seeks Director of Research and Evaluation. Deadline: November 25, 2013. Dawes Arboretum, Newark OH, seeks Archivist. Deadline: November 29, 2013. Chicago Cultural Alliance, Chicago IL, seeks Executive Director. Deadline: December 15, 2013. Newberry Library, Chicago IL, seeks independent scholar or researcher for Weinberg Fellowship. Deadline: January 15, 2014. Indiana Historical Society, Indianapolis IN, seeks Director, Education & Community Engagement. Applications accepted until position is filled. Lombard Historical Society, Lombard IL, seeks Executive Director. Silver Oaks Communications, Moline IL, seeks Multimedia Programmer/Museum Interactive Developer. Ohio Historical Society, Columbus OH, seeks Archaeology Collections Assistant. Milwaukee Public Museum, Milwaukee WI, seeks President/CEO. National Mississippi River Museum & Aquarium, Dubuque IA, seeks Executive Director. American Swedish Institute opens the holiday season with a free family concert Saturday November 9, 2013, 10-5 p.m. by visiting Norwegian soprano Ashild Skiri Refsdal, co-sponsored by the Edvard Grieg Society, as well as other fun activities for the whole family. Join Blue Earth County Historical Society, Mankato MN, for a weekend celebrating 110 years of tradition, November 8-9, 2013. Free admission, refreshments, door prizes. Author Julie Schrader will speak on "Christmas in the Deep Valley," Saturday November 9, 2 p.m. Call 507-345-5566 for more information. Minneapolis Institute of Arts will hold a one-day symposium, "Mobility, Change & Exchange in African Art," November 9, 2013, 8:30-4 p.m. Celebrate the re-opening of the MIA's African Galleries that evening, 4-6 p.m. RSVP to DiAnne Pappas, 612-870-3011. Landmark Center, St. Paul MN, invites the public to celebrate German traditions for St. Martin's Day, Sunday November 10, 2013, 4-6 p.m. Free, but please bring donations for Joseph's Coat. Excelsior-Lake Minnetonka Historical Society, Excelsior MN, announces a new series, "Tapping History: Pints and Reflections on Lake Minnetonka's Past," meeting the second Monday of each month at Jake O'Connor's, Excelsior MN. Author Fred Johnson will speak on his book "The Big Water: Lake Minnetonka and its Place in Minnesota History," November 11, 2013, 7 p.m. Call 612-805-2397 for more information. In Their Own Words Veterans Museum, Perham MN, is hosting a Veterans Day event Monday November 11, 2013, 11 a.m. Free meals for veterans and their families, museum tours, and drawings. Call 218-346-7678 for more information. Friends of LeDuc of Historic Hastings meets Tuesday November 12, 2013, 7 p.m. at LeDuc Historic Estate, Hastings MN. Call 651-437-7055 for more information. Stearns History Museum, St. Cloud MN, hosts Laura Becker-Pallister, who will speak about her plan to create a "Museum for the Fallen," to honor the service and sacrifice of Minnesota's military, Wednesday November 13, 2013, 9 a.m. Call 320-253-8424 for more information. Carlton County Historical Society, Cloquet MN, hosts Ambrosia Trio, a trio of ladies singing songs from the 1930s and 1940s, Wednesday November 13, 2013, noon. Call 218-879-1938 for more information. Hennepin History Museum, Minneapolis MN, will hold their annual gala "History Unmasked: a 1960s Masquerade to Benefit HHM," November 14, 2013, 6:30 p.m. Cathy Wurzer hosts. Tickets: $55/members; $65/nonmembers. Call 612-870-1329 for more information. Scott County Historical Society, Shakopee MN, invites the public to stop by Kingsway Retirement Center, Belle Plaine MN, to participate in a community museum exhibit, Saturday November 16, 2013, 2-3 p.m. Bring an object related to the theme "Things I Cherish," write a label explaining your object, and view others' contributions. Call 952-445-0378 for more information. Pond Dakota Heritage Society, Bloomington MN, hosts Jeff Williamson, who will portray his great-grandfather John P. Williamson, a missionary to the Dakota shortly before the U.S.-Dakota War of 1862, Sunday November 17, 2013, 2 p.m. Call 952-563-8738 for more information. Ramsey County Library-White Bear Lake, hosts Sara Markoe Hanson of White Bear Lake Area Historical Society, who will discuss the World War II homefront in White Bear Lake, Monday November 18, 2013, 6 p.m. Call 651-724-6022 for more information. St. Cloud Area Genealogists meet Tuesday November 19, 2013, 7 p.m. at the Stearns History Museum. SCAG board members will 'tell-all' and speak about their genealogy-related experiences. Contact Dan Schroeder, 320-685-3629, for more information. Minneapolis Central Library invites the public to a commemoration of the 150th anniversary of Abraham Lincoln's Gettysburg Address, Tuesday November 19, 2013, 6:30 p.m. Author John D. Cox will lead the discussion. Call 612-543-8000 for more information. Wright County Historical Society, Buffalo MN, presents their "Future of Tractors" program focusing on the AGCO Corporation. Jay Mulso from AGCO, Jackson MN, will give two presentations, 1:30 p.m. and 6:30 p.m., Tuesday November 19, 2013, at the historical society. Call 763-682-7323 for more information. Scott County Historical Society, Shakopee MN, hosts a harvest-themed Kids' Kraft, Saturday November 23, 2013, 10:30-11:15 a.m. Free, but call 952-445-0378 to register. Pond Dakota Heritage Society, Bloomington MN, hosts Colette Routel, Associate Professor at William Mitchell College of Law, who will speak on the creation of the Minnesota bounty system in 1863 and the court case that finally ended it; Sunday December 1, 2013, 2 p.m. Call 952-563-8738 for more information. Gibbs Museum of Pioneer and Dakotah Life, Falcon Heights MN, invites the public to celebrate an 1800s Minnesota Christmas, Saturday December 7, 2013, 10 a.m. to 2 p.m. Reservations required; call 651-646-8629. Tickets: $10/adults, $9/seniors, $7/children. Operated by Ramsey County Historical Society, St. Paul MN. Comstock House, Moorhead MN, will host "Holiday Tours and Treats," Sunday December 8, 2013, 1-4 p.m. Admission: $5/person; children 5 and under are free. Contact Amanda Nordick, 218-291-4211, for more information. Marian Rengel, Outreach Coordinator for Minnesota Digital Library, will be the guest speaker at Minitex's webinar "Exploring Minnesota Reflections as a Research Tool for History Day," Wednesday November 13, 2013, 3-4 p.m. Free. Stearns History Museum, St. Cloud MN, offers a new monthly class on the third Wednesday of each month to highlight the resources available at their research center. Join them on November 20, 2013, 9:30 a.m. for "Introduction to the Stearns History Museum Research Center/Archives" followed by "Basics of Genealogy." RSVP to Sarah Warmka, 320-253-8424. American Association for State and Local History will hold a new webinar "Getting Ready for Grants," Thursday November 21, 2013, 3-4:15 p.m. ET. Cost: $40/AASLH members; $115/nonmembers. Register online. Stearns History Museum, St. Cloud MN, will hold a press conference on Tuesday November 12, 2013, 2 p.m. to announce a new partnership with the Smithsonian Institution in Washington D.C., through the Smithsonian Affiliates program. Stearns History Museum will be the only Smithsonian Affiliate in the State of Minnesota. Call 320-253-8424 for more information. If you are a collections professional within a natural history museum or academic collection, please help IDigBio and Yale Peabody Museum by completing a survey about digitizing source materials in natural history collections. Deadline: November 14, 2013. 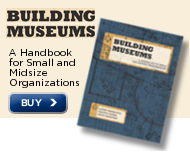 Museum Trustee Association is a good resource for museum board members and trustees. This Veterians Day think about becoming a Blue Star Museum. The program offers free museum admission for military service members and their families, from Memorial Day through Labor Day, through a partnership between Blue Star Families, the National Endowment for the Arts and over 2000 museums across the country. For more information on becoming a Blue Star Museum please e-mail the Project Manager, Desiree Moore. Please welcome Sarah Beimers back to Minnesota's State Historic Preservation Office. After working in Ohio and in Minnesota Historical Society's Historic Sites Department, Sarah has returned as Manager of Government Programs and Compliance. Original Local, by Heid Erdrich.